The wheelchair is rolling into the 21st century with a twist bound to elicit plenty of double takes: foldable wheels. 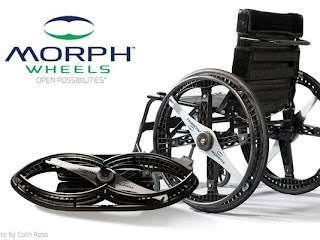 Morph Wheels, designed by the same guy who created foldable wheels for bikes, have the potential to make travel of all sorts less cumbersome for a chunk of the nation's estimated 2 million-plus wheelchair users. "This is the first foldable wheelchair wheel," says Kathleen Hanek, director of product management at Maddak-owned Morph Wheels. "It's all about making things easier and increasing accessibility for wheelchair users." It's also about making money. Morph Wheels ranks near the priciest end of wheelchair wheels: $950 for a set of two — nearly double what some wheels cost. And, at about 7.5 pounds each, they weigh considerably more than more conventional 4.5-pound wheels. The extra weight is because the tires are solid rubber — no air — and because the wheels are made from glass-filled nylon, not metal. But, in exchange for the extra weight — and upper-end price — consumers get the convenience of foldable wheels. Also, unlike most wheelchair wheels, these generally fit into overhead bins on flights. And into tight rental car spaces — a boon for some business travelers. "I've never seen anything like them," says Bob Vogel, a paraplegic and wheelchair user who is senior correspondent for New Mobility, the magazine owned by the United Spinal Association. "I love the innovation." But, Vogel adds, foldable wheels may only appeal to a niche market. "I don't see your average user taking the time to fold a wheel to get it into a car," he says. "If it takes an extra 20 seconds per wheel, that's a lot of time." To fold the wheels, they must be detached from the chair. They are folded by first removing the axle that holds the wheel in place. The wheel, essentially, squishes in half when you press on both sides. Foldable wheels where first conceptualized in 2007 for bicycles by British designer Duncan Fitzsimmons. After receiving inquiries from the wheelchair community, he eventually teamed up with Maddak and redesigned the wheels for use on wheelchairs. The company relied on a focus group of wheelchair users to help it perfect the design. The focus group kept prodding for improvements. "It looks simple, but it was an engineering feat to come up with what we have," says Hanek. The design was named the top design in the transportation industry in 2013 by the London Museum of Design. The wheels comes with a three-year warranty. "The trick was to create a wheel that wasn't just a folding wheel," Hanek says. "It needs to act and feel just like a normal wheel when it's unfolded."